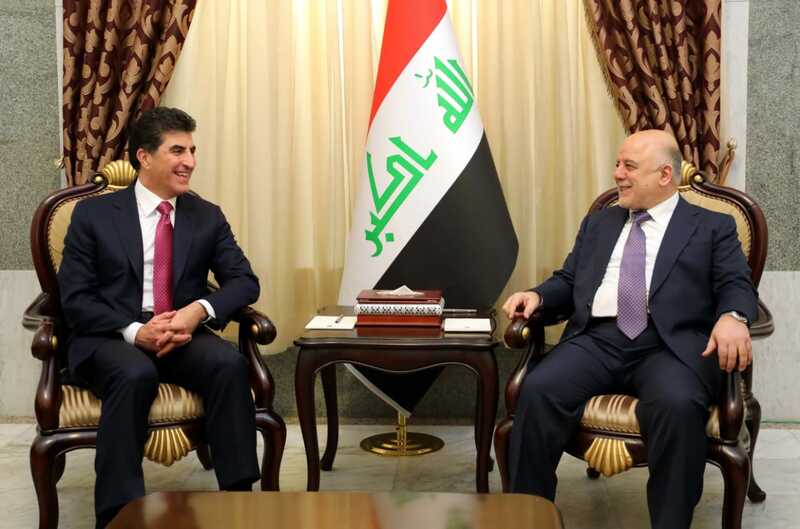 Prime Minister Nechirvan Barzani met with the Iraqi Prime Minister, Mr. Haider Al-Abadi in Baghdad on Monday. They discussed the political situation in Iraq and the relations between the Kurdistan Regional Government and the federal Government of Iraq. The two leaders agreed to pursue the talks and coordination between KRG military forces, the Peshmerga, and the Iraqi army in the fight against terrorism. They also exchanged views on the ways to address the current challenges and the efforts to forming the new Iraqi government in a way that it would meet the demands of the Iraqi people in improving economic conditions, reconstruction, providing services and creating job opportunities. Kurdistan Region Presidency Chief of Staff Dr. Fuad Hussein also attended the meeting.